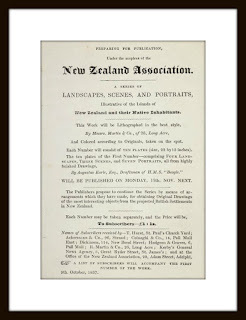 "Prints of NZ scenes, landscapes & portraits"
From 1837 this is easily one of the very earliest advertisements for prints of New Zealand. We spend a lot of time figuring out the different reasons people choose to buy prints and what themes or subjects would interest groups of buyers. 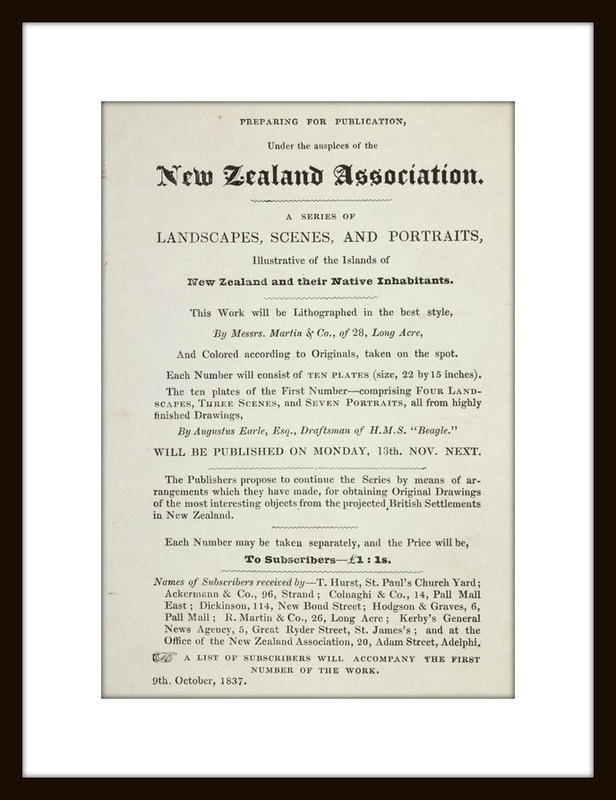 It is hard to figure out why prints from the New Zealand Association folio would have been purchased, and a list of subscribers would be interesting if one still exists (please leave a comment if you know its whereabouts!). Were they decorative, illustrative or aspirational? Or commercial propaganda of the New Zealand Association? The plates in the folio are from paintings and drawings by Augustus Earle, the "Wandering Artist" who accompanied Charles Darwin on his famous voyage on the Beagle. 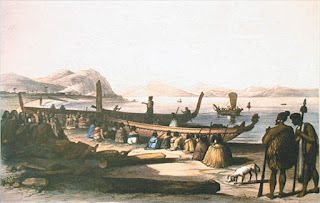 The New Zealand sketches and paintings of Augustus Earle are among the most important pre-1840 impressions, and the prints made from them to illustrate his book on New Zealand, and the later album produced for the New Zealand Association, are both dramatic and delightful. Earle was the first trained artist to spend any time among the Maori (it was another twenty years before a comparable study, Angas' The New Zealanders Illustrated, would be published). Earle was the son of an American artist who settled in London after the American War of Independence. After studying at the Royal Academy, Augustus exhibited there from 1806 to 1817, and later from 1837 to 1838. He first went to sea in 1815, and over the next twenty years earned the nickname "The Wandering Artist". He lived in America for almost two years from 1817, and from there visited Brazil, Chile, and Peru. Earle arrived in Australia in 1825, and during the three years spent there not only drew and painted but also set up in business as a lithographer. From Australia he went back to England, via India. In 1831 he was appointed draughtsman to theBeagle, with Charles Darwin. Illness forced Earle to leave the ship at Montevideo. He stayed there several months before returning to England, where he died in December 1838. A Narrative of a Nine Months' Residence in New Zealand was published in 1832: it contains six aquatint views which, though small, are good examples of a process used for few New Zealand prints. Better known, though still rare, are the ten lithographs in the New Zealand Association album. A longer series was proposed, and it is regrettable that it was never published — probably because the Association could not afford it. Among the plates is the particularly charming Native Village and Cowdie Forest (since re-published by Avon Fine Prints), which, Earle noted, "is literally buried in the forest, and is a country residence of Patuoni, the chief of the district; here he plants his potatoes, cumera, [kumara] and maize . . . The mighty forest by which the village is surrounded consists chiefly of cowdie [kauri], the largest and most valuable of the New Zealand trees. We halted at this village on our way to the Bay of Islands..."